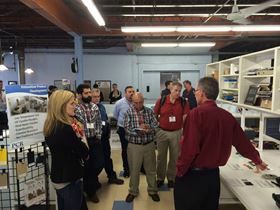 Hands-on lab demos allow attendees a close up look at key technologies and processes. The next US Powder Coating (PC) Summit is scheduled for 4-5 October 2016, in Columbus, Ohio, USA. The PC Summit is a two-day event offering educational sessions for both new and advanced powder coating technologists. This event is produced by The Powder Coating Institute, The Powder Coating Research Group, and Powder Coated Tough magazine. The summit offers lectures presented by experts in the powder coating industry. Sessions cover subjects from chemistry and formulation to pretreatment, applications, and curing, touching on aspects of powder coating today and the next generation of coating technology. The event includes two full days of dialogue partnered with lab demos and a tabletop networking reception. Attendees will learn about emerging powder technology and will learn about the fundamental research feeding the advancements. Attendees can choose to attend both days, which include all presentations and lab demos, along with the networking reception the first evening, or a single day. This story is reprinted from material from the Powder Coating Institute, with editorial changes made by Materials Today. The views expressed in this article do not necessarily represent those of Elsevier.